The Italians are well-known for their cuisine and not just because of those fancy names that roll off the tongue but also because Italian cuisine pays so much attention to flavor. No wonder the culinary world is so obsessed with Italian foods. With Italian cuisine, there’s so much to pick from, so much to eat and so much to relish. From pasta: ravioli, tortellini, penne to sauces: carbonara, bologna, pesto. There are so many dishes to love in Italian cuisine. I love the sun-kissed warmth and texture of Italian foods, and that’s why they are my go-to recipes when looking to impress guests with my cooking. The freshness of the ingredients, the combination of flavors and the homey feeling …I can go on and on but I’m sure you get the picture; Italian meals are made from the heart. Sometimes they have a reputation for being a bit heavy, but we’ve found some that capture the essence of Italy all with clean eating ingredients! Here are 15 clean eating Italian recipes to make you look like a pro. This recipe is very simple and really quick. I love the crunchiness of the ciabatta which teams up great with the delicious topping of roasted tomatoes and fresh basil. It’s a very chic appetizer or even a breakfast meal. A golden crust loaded with crispy kale, a nutty vegan pesto and toasted cheese make this recipe a pizza lover’s delight. You should know that this pizza is also meatless and vegetarian-friendly. Asparagus is a veggie that is usually overlooked but this recipe makes it the belle of the ball with truffled eggs and parmesan to dress it up. I love the warm, nutty flavor of roasted asparagus. And you can serve your eggs half-boiled or over-easy. This appetizer is so rich, with lots of color, aroma, and flavors. Your taste buds are literally taken on a rollercoaster ride with this dish. I like to add vegan Italian sausages to this recipe- but it’s also good with real deal. It’s a savory ambrosia that would captivate even the pickiest of eaters. What is a panzarotti you ask? Well, my friend, it is pizza dough stuffed with olives, capers, spinach and cheese (the original recipe uses vegan, but you do you!). They are also traditionally fried, but are also quite a treat when baked- the point is, you cannot go wrong with these treasures. How pretty is this dish? This dish is made with whole wheat linguine tossed with a sauce of pureed beets with a balsamic fragrance and a dressing of cashew ricotta. I love this recipe because it is an elegant, unusual combo of healthy, savory ingredients that tickle the taste buds. Here is it yet another awesome recipe from Vegetarian Times. This recipe is quick and easy but colorful and tasty as well. The blistered tomatoes add a fresh taste to this dish without overpowering the marjoram and marries well with the parsley. The feta cheese is optional for non-dairy eaters. The tomato jam has a slightly tangy taste like ketchup but has the same consistency as any jam. This recipe is one of my go-tos for a quick lunch for the kids. I usually use Stevia or dates in place of sugar to make it healthier. This recipe is great for a weekday dinner when you need something quick, easy and delicious. The thyme gives a great taste and aroma to the dish. Remember to use homemade pasta sauce as opposed to the store-bought version, it’s a lot healthier. The crunchy asparagus makes this a winner for me. Because no Italian feast is complete without dessert! These sweet treats are just so chic and delicious. You can taste every single ingredient used in this recipe in just the first bite. Cinnamon, marsala wine and Greek yogurt make these delightful rolls taste exquisite. The cannoli shells can be premade and frozen for future use. The caprese salad is surely the king of salads, in my opinion. 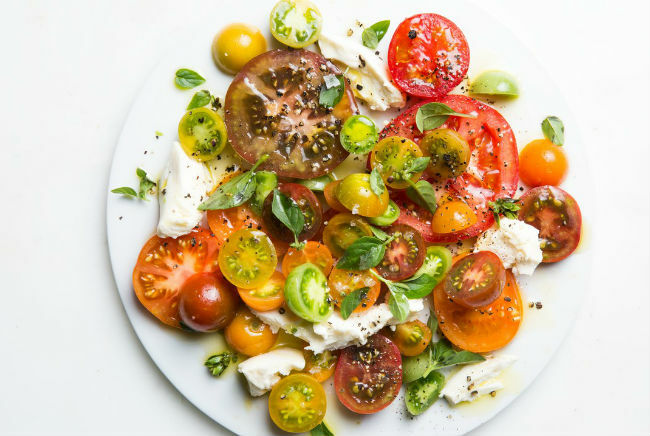 This recipe brings the freshness of tomatoes, the flavor of basil and the texture of cheese into a perfect symphony on your dish. This salad can be served with any Italian bread of your choice. Here’s a little confession – I love frittatas because they are the absolute solutions to using up leftovers from previous meals. Now how about that for time-saving cooking tips? Ooh la la! This recipe ties in two great classics of the Italian cuisine: Wheat Ziti Pasta and Tomato Sauce. So much great flavor and a perfect texture; one taste of this meal and you will be hooked. My kids absolutely love biscottis! And this recipe is just perfect for making those hard-to-resist treats. The almond and vanilla extracts are a heavenly blend of flavors and I like to kick it up a notch by adding lemon zest and dried blueberries. These can be served with coffee, milk or wine.